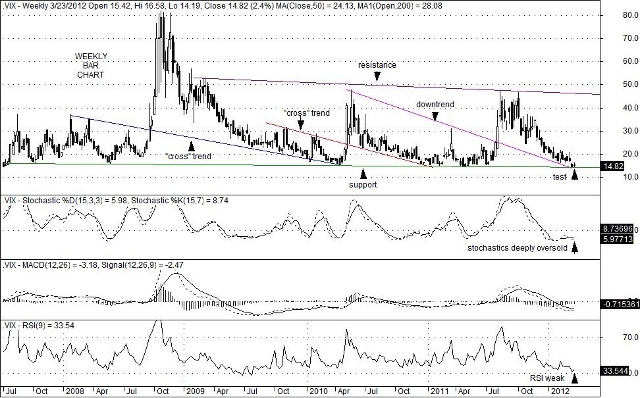 As Q1 2012 comes to close, it is worth noting that the CBOE S&P 500 Volatility Index (VIX) has already tested and held key long-term trend line support now at 13.66 back on March 16th. With worries over European sovereign debt diminished and on the “back burner”, and withU.S.domestic economic data continuing to show improvement at a modest pace, low volume sessions have prevailed in recent weeks. In addition, a number of upwardly revised earnings estimates have helped steady the S&P 500 index and contain wide intraday price swings. That being said, history has shown that once this particular VIX trend line has been successfully tested, a relative “peak” in equity prices occurs soon after. Moreover, it is usually followed by reversal to lower levels within weeks or possibly months of the initial test. “Window dressing” in front of quarter’s end will likely keep a firm bid to equity prices this week. Still, “earnings season” will soon begin and with it, position squaring in the form of profit taking could result. Nevertheless, first key resistance now at the 1,425 level on the S&P 500 has yet to be reached. Nor has key resistance near 13,700 on the Dow Jones Industrial Average been tested either. As a result, near-term strength followed a correction to lower levels later this spring might be the path that key equity indices eventually take. Characterized by a steady rise since the December 2011 low of 1,158.67, the S&P 500 Index is now within striking distance of testing key upward sloping trend line resistance now sitting at 1,424. 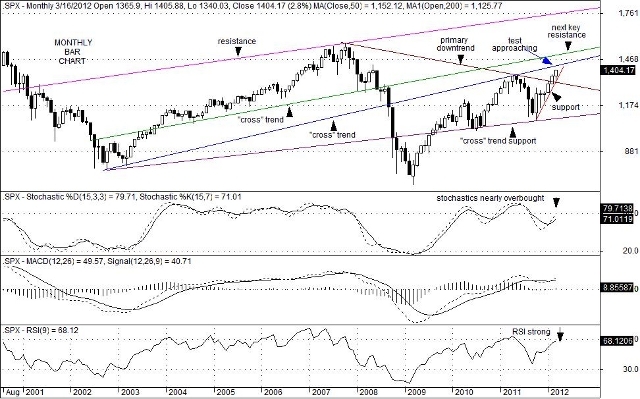 Although nearly in an overbought condition, monthly stochastic studies are just a whisker away from being so, which raises a yellow flag of caution to the bearish case. Nevertheless, the “spot” CBOE Volatility Index (VIX) has already tested key trend line support (now at the 13.66 level) which was needed to confirm a market peak. History has shown that a test of this downward sloping trend line has matched up well with the past four relative “market peaks” that occurred in May 2008, April 2010, February 2011 and April 2011. That being said, a number of market sectors appear to be poised to score additional gains that could force equity prices higher than the 1,424 resistance level would be consistent with. They include banks, semiconductors, healthcare, and the NASDAQ 100 Index (QQQ). A solid resurgence in the Dow Jones Transportation Index along with new breakout highs in the retail and consumer cyclical sectors must be viewed as bullish too. Continued improvements in weekly employment data, signs of stabilization in the housing sector, and an increase in C&I loans suggest the domestic economy does appear to be on the mend. Without trying to get overly rosy while looking at the rear-view mirror, there remain a number of challenges on the horizon as well. Higher gas prices, a jump in the U.S. trade deficit to $52.6B in January, it’s highest reading in more than three years, a slowdown in China’s growth rate, and toned-down but ever present worries over tension between Israel and Iran are there, but largely “known” by traders and investors. As a result, there is a chance that the 1,424 area could give way to buying activity, which at this point might be the “surprise” that is not expected. If such a break were to occur, an extension up to key trend line resistance near 1,495 could result. Coincidentally, that level would “match up” better with similar trend line resistance seen on the Dow Jones Industrial Average which sits in the 13,650 to 13,750 area, depending on how the trend line is drawn. It might also match-up better with a possible test of “channel top” resistance on the Dow Jones Transportation index, which sits near 5,750. The inability to rise above 1,424, or a break below steeply rising trend line support currently at 1,340 would go a long way, however, to suggest that a correction to the downside on the S&P 500 Index (SPX) may soon be at hand. You are currently browsing the Charted Territories blog archives for March, 2012.